I clicked this photo a couple of days ago, on my way to work. This is P D'Mello Marg, an arterial road that goes by the docks and is always filled with trucks (which explains that No Parking sign!). As you can see, every house on this street is two-storeyed, with a ladder stacked up against it. To keep your balance on the ladder (like the guy in the blue shirt is doing), you hang on a piece of rope cleverly left dangling from the washing line. An ingenious contraption, I thought. See if you can spot the rope for the other ladders as well! Another thing I noticed is that all doors have numbers on them, marking the legal right of the owner to live there. 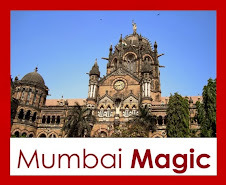 They are registered with the Mumbai municipality. So the man in the blue shirt is Mr. Somebody, in this city of illegal hutments. The other type of houses in India where neighbours share walls is at the highest end of the caste spectrum - the houses of the Tamil Brahmins. Here is a Brahmin street (an agraharam). The joining of the houses signifies more than just neighbourly acceptance. It is a sign that they are all the same community and can live and eat together without losing caste. 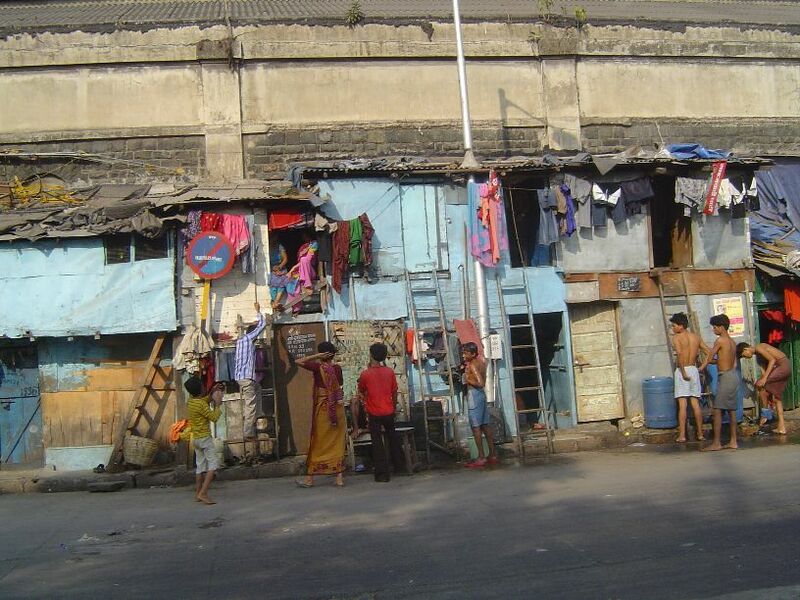 In the slums of Bombay, the old caste rules are breaking down as people jostle for space. It is a welcome fall-out of the overcrowding that we all moan about so much. 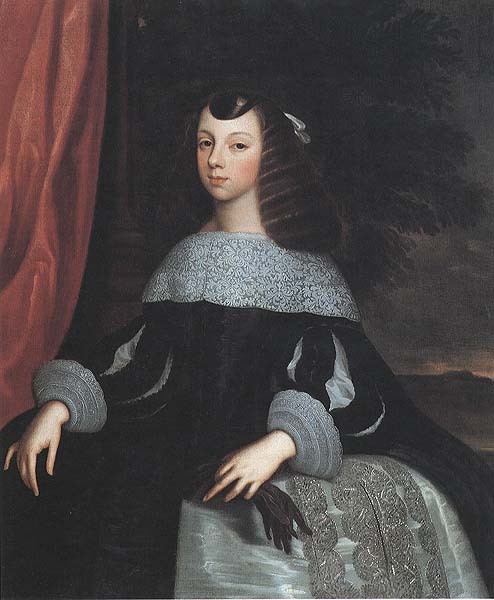 Here she is - Infanta Catharina Braganza, Princess of Portugal. The island of Bombay formed part of her dowry when she married the English King Charles II. You see, Charles II had inherited a lot of debts, and run up some more of his own, so a rich wife seemed like the perfect answer. Catharina brought as part of her dowry, several ships laden with luxury goods which Charles sold to pay off his debts. 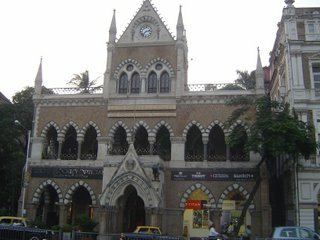 He also leased Bombay to the East India Company for ten gold pounds per annum (which led to the development of Bombay as a major shipping and trading centre). In spite of a philandering husband, and several miscarriages, Catharina established herself well in the English court and became something of a trend-setter. Her lasting legacy to England was tea (and you thought tea was a British thing?). The shiploads she got as dowry included a large chest of tea. She was used to tea in her native Lisbon, where it was popular in elite circles. She introduced tea-drinking to the English court, where it became something of a fad. From there, it spread to aristocratic circles and then to the wealthier classes, and finally acquired its popular status as a British institution! At a temple in Walkeshwar, this illustration caught my eye. 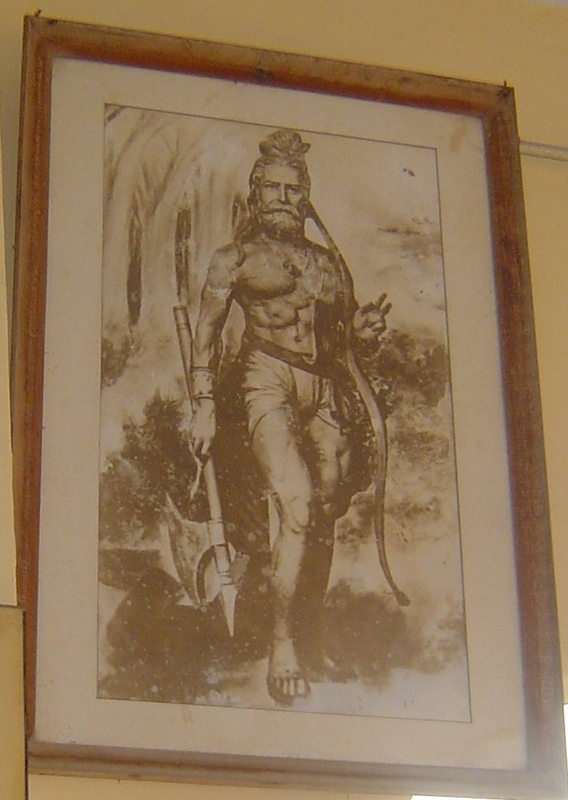 Muscled and handsome, this is Parashurama, the sixth incarnation of Vishnu. The western coast of India - a long strip starting from Nasik in Maharashtra, down to Kanyakumari in the south - is called Parashuram-Shetra (Land of Parashurama). 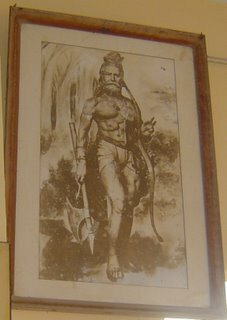 The story in the Puranas is that Parashurama flung his axe into the sea asking for land. The sea receded upto where the axe was flung, creating Parashuram-Shetra. 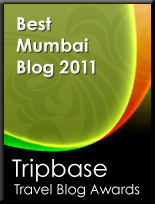 I looked up the history of Maharashtra, starting from the Stone Age. It turns out that in the Upper Paleolithic age (about 25,000 years ago), the climate started becoming arid, and the rivers shallow. The sea around the Konkan region began to recede and a large land mass did emerge on the Western Coast. During that period, the people who lived in Maharashtra were hunter-gatherers, using Stone Tools (blades and flints made of silicaceous stones). There is evidence that they had discovered fishing as well. So - maybe these were the people that saw the sea recede, and wove it first into a tale? Is that why Parashurama has an axe and a bow, because he represents the hunter-gatherers? If only I could go back in time and find out! I went to the Spastics Society of India (SSI) recently, and found them in the middle of something new. They are trying to bring disabled children into the mainstream. They're working in six Mumbai slums, trying to figure out what it takes to put children with disabilities into existing Government education programmes. That way, these children will not be marginalised, segregated and ignored, they will stop being "Invisible Children". It's an ambitious effort, to say the least. 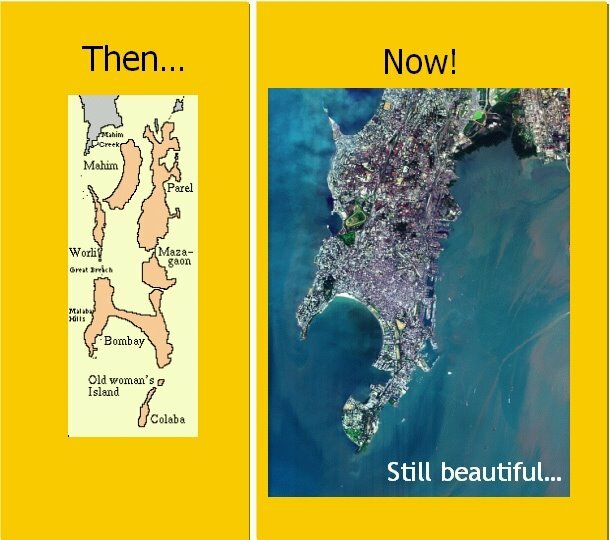 But Mumbai has a long history of aware citizens making a big difference, and SSI has the dedication and the professionalism to make this happen. If you hang around long enough at the Gateway, you'll eventually see all of India passing by (yes, a bit like Times Square!). 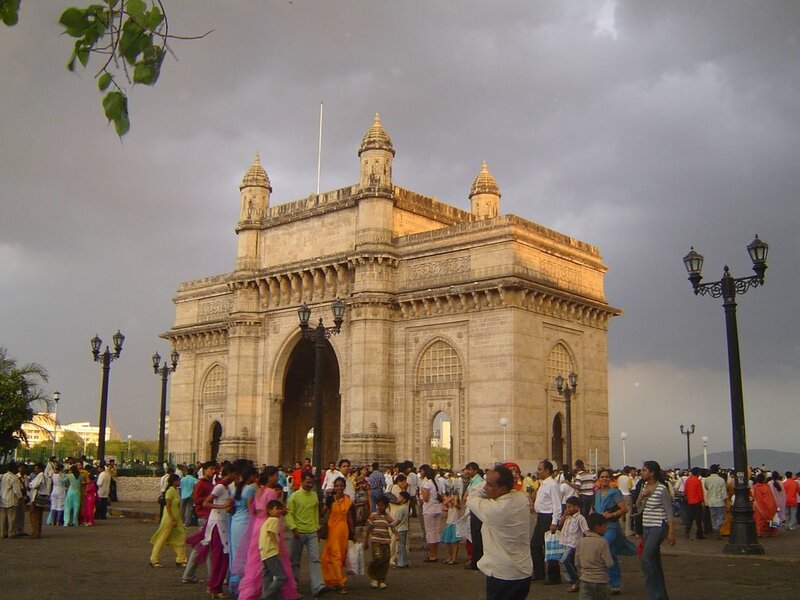 Gujarati, Bengali, Bihari, Punjabi, Tamilian - everyone comes to see India's favourite entrance arch. I caught the building on a suddenly stormy evening last week. The pigeons had smartly tucked their wings and sheltered under the Taj. They weren't about to risk the breeze. 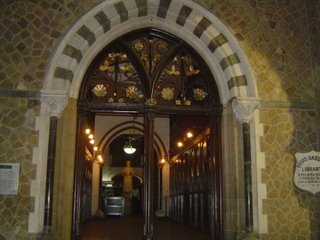 The sky was overcast, and in the strange light, the Gateway was a shining pale cream-yellow, instead of its usual duller colour. 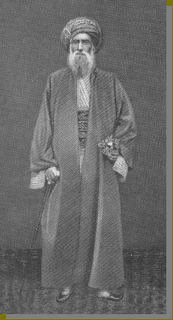 But I was more interested in cataloguing what the women wore. Deep pink, bright green, several shades of orange, blue and maroon...sarees draped, tucked and pinned, pallus flowing over shoulders, every colour in the world fluttering in the quadrangle. What makes us so colour-crazy? Is it the sun, driving us mad? 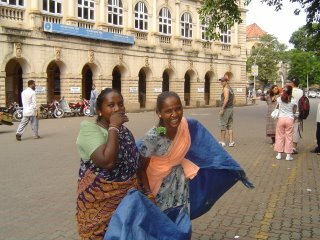 Or a stray gene perhaps, that nudges us in saree shops, saying "Go get that electric blue, girl!" What a difference from my two weeks in London, where everyone wore black and grey and pastels. It must be the sun. Or maybe - hmm - maybe it's the food. Now there's a thought. The Prince of Wales Museum has this sculpture of a yaksha and a yakshi. In Hindu mythology, yakshas are mythical figures, half-god, half-demon, who live under the mountains, guarding the wealth of the earth. I was pretty intrigued by this yaksha in particular - because in typical Hindu sculpture, yaksha men are fat pot-bellied dwarves, and this guy was anything but that! 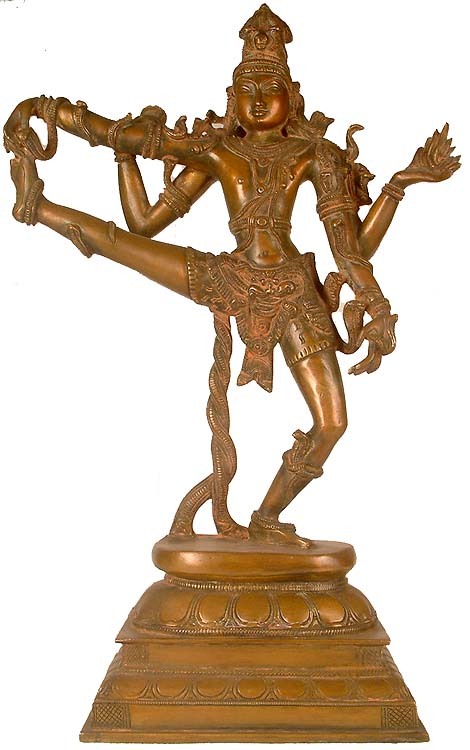 A little digging around gave me half the answer - this is a Jain yaksha, not a Hindu one. But the pot-belly still ought to apply - so how did they become so good-looking? I looked it up some more - and found a story. 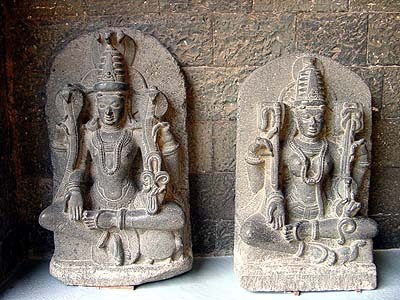 The male yaksha's name is Dharanendra, and that is his consort Padmavathi. The couple rose from their sub-terranean world, to protect Parshvanatha, the 23rd Jain Tirthankara (Tirthankara = Enlightened One). Dharanendra spread his serpent hood over Parshvanatha, and Padmavathi a diamond umbrella. Dharanendra's vehicle is the popular tortoise (can you see it, just under his knee? 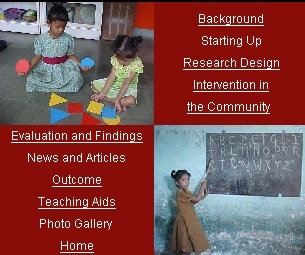 ), but Padmavathi has a curious vehicle - a rooster with the head of a snake. Go figure. And as for the Tirthankara they helped - here is a sculpture of Parshvanath, also from the Prince of Wales museum, with the serpent Dharanendra protecting him. If you see a similar sculpture elsewhere, minus the snake, it's likely to be Mahavira, the 24th Tirthankar, who founded Jainism. Let's get some facts right, shall we? The tribal communities of Nags, Munds and Bhils inhabited Maharashtra in ancient times. They were joined by the Aryas, the Shakas and the Huns, who came from the North, as well as by foreigners, who arrived by sea. 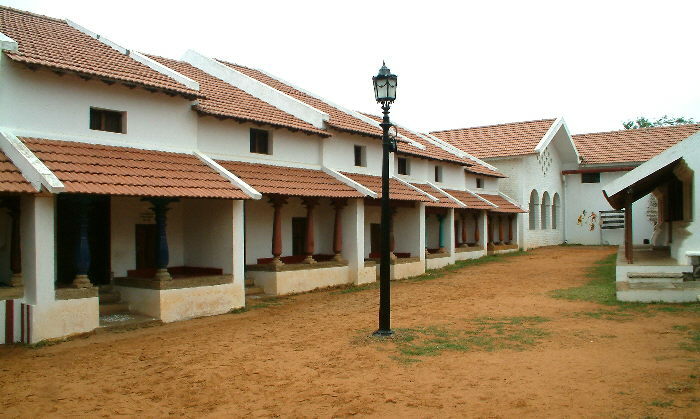 The Dravidians from the South also settled in the land, joining a group which collectively became known as 'Marathas'. So 'Maratha' in historical terms refers to an amazing mix of people. In popular usage, the word Maratha is used to identify a distinct warrior community which has dominated the political scene of Maharashtra since medieval times. This community has several aboriginal tribal elements - for example, Khandoba (sword-father) and and Bhavani (mother goddess), the two chief deities of the Marathas, are aboriginal in character. 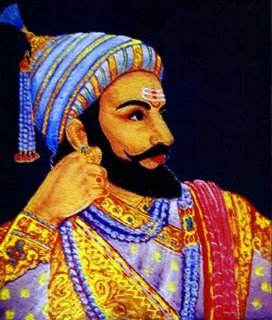 Shivaji, a 17th century Maratha chieftain, brought political prominence to the Marathas. 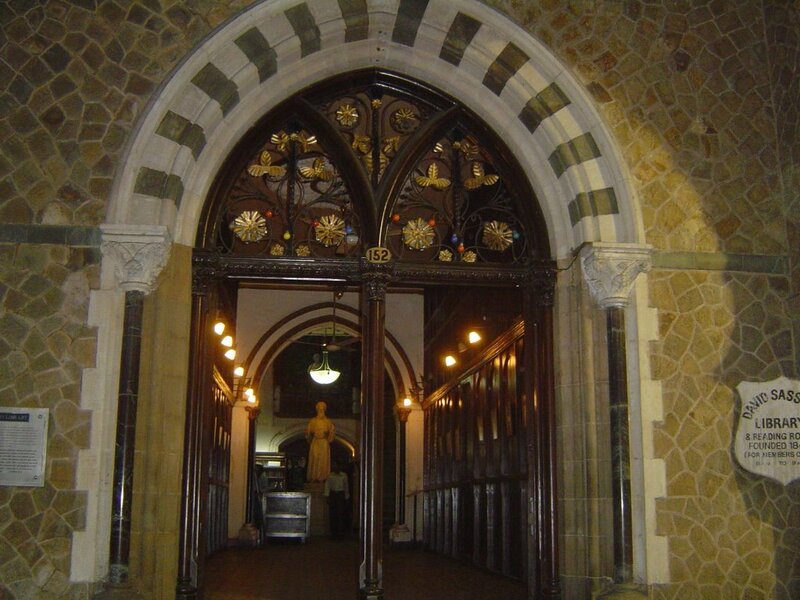 You're sure to spot garlanded statues and photos of Shivaji if you're travelling in Bombay. My masala box at home always has cinnamon in it - our ritual Saturday biryani is incomplete without this magic bark. 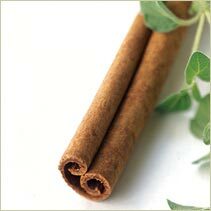 The Romans used cinnamon, so did the Greeks, but until a few hundred years ago, myths about the origins of cinnamon persisted. I was amused to read this description of cinnamon, by Herotodus, the fifth century BC Greek historian, who thought cinnamon came from Arabia, from giant birds! "Large birds bring those dry sticks called cinnamon for their nests, which are built with clay on precipitous mountains that no men can scale. To surmount this difficulty, the Arabians have invented the following artifice: having cut up into large pieces the limbs of dead oxen and other beasts of burden, they leave them near the nests and retire to a distance. The birds fly down and carry off the joints to their nests, which are not strong enough to support the weight of the meat and fall to the ground. Then the men come up and gather the cinnamon, and in this manner it reaches all countries". Banganga in Walkeshwar is dotted with little temples, so it kept my camera busy. Of all the photos I clicked, though, this is the one that made me most curious. 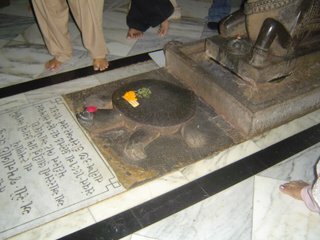 A Shiva temple, with a turtle? The turtle, of course, is the second incarnation of Vishnu. So what's Vishnu doing in a Shiva temple, I asked myself. And then I realised - Vishnu is praying to Shiva! This is the legend from the Shiva Purana, when the gods and the demons churned the ocean for nectar. When the sea spewed the deadly poison halahala, the gods despaired and even Vishnu the turtle could not bear the fumes. "O Creator with Fire in your mouth, the Earth your feet, Time your motion, the Sky your navel, the Wind your breath, the Sun your eyes! Only you can save us from the halahala!". A persuasive prayer indeed! And as many of us know, Shiva quaffed the poison, which turned his neck blue, earning him the name Neelakantha. But did you know? A few drops of the poison dribbled from his lips, says the Shiva Purana, to be shared by serpents and scorpions to be their venom. 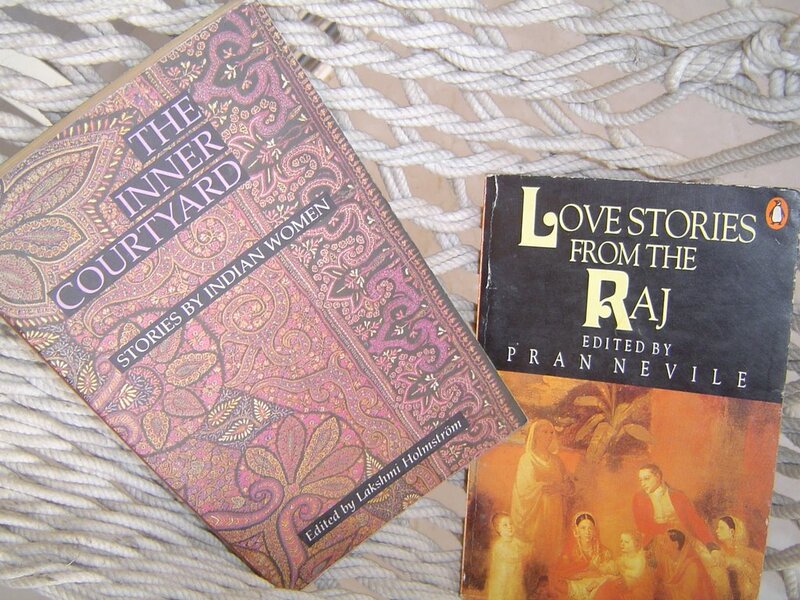 If you'd like to read the original story, try Ramesh Menon's 'Siva - the Siva Purana retold'. It's fascinating. 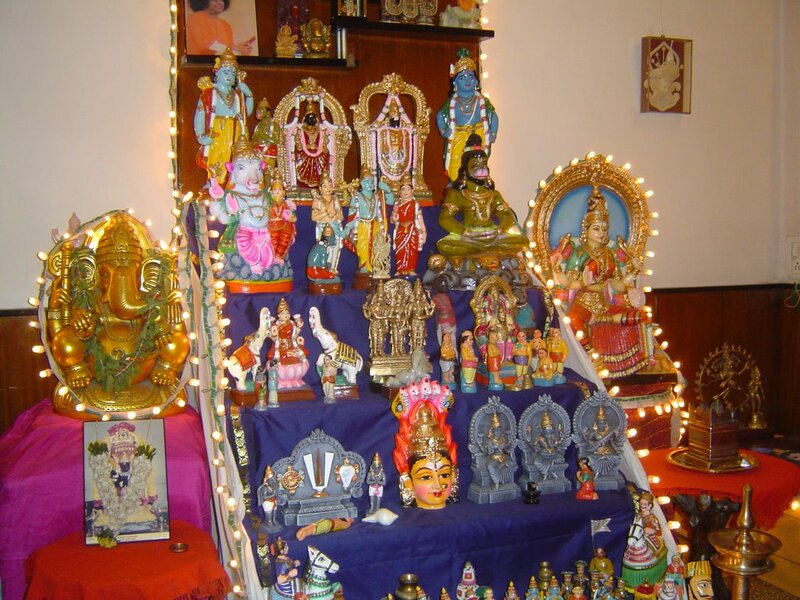 In the district of Kanchi, near Chennai, there's a village called Tirukkachur. Literally, Turtle Village. The village temple is 1200 years old, and in the temple, there's a sculpture of Vishnu as turtle, praying to Shiva. 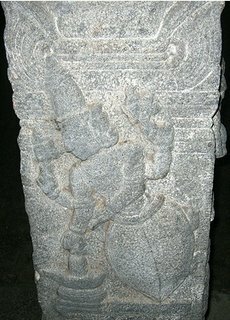 Can you see the four-armed Vishnu, with the rounded turtle lower half? 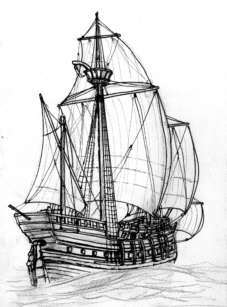 Since we seem to be talking about the Portuguese - this is the kind of ship in which Francis Alemida sailed into Bombay port, one morning in 1509. It was large enough to be stable in heavy seas, and roomy enough to carry provisions for long voyages. Interestingly, the Portguese word for this kind of ship is nao, identical to the Hindi nao, which comes from the Sanskrit nauh, meaning boat. Not only in Portuguese and Hindi - the word for boat or ship is amazingly similar in Welsh (noe), Greek (naus), Armenian (nav), Old Irish (nau), and Old Norse (nor). Linguists agree that the original source of such common words were the Proto-Indo-Europeans, a group of people who lived 5500 years ago (the time scale is much debated!). They were pastoral nomads, who had domesticated the horse (eqwos). The cow (Proto-Indo-European 'gwous') played a central role, both in mythology and reglion. Aside: the Sanskrit word for cow is go or gow. The origin and migration of the Proto-Indo-Europeans is a subject of much dispute - did they migrate from Europe to Asia, or from Asia to Europe? Scholars can't seem to agree. 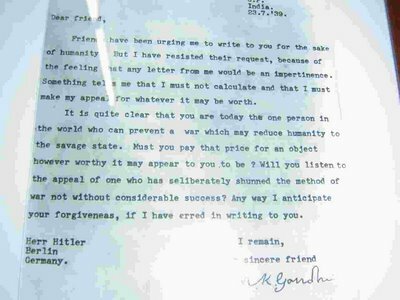 But the history of these words continues to fascinate. So... We clicked this photo one evening at Fort. 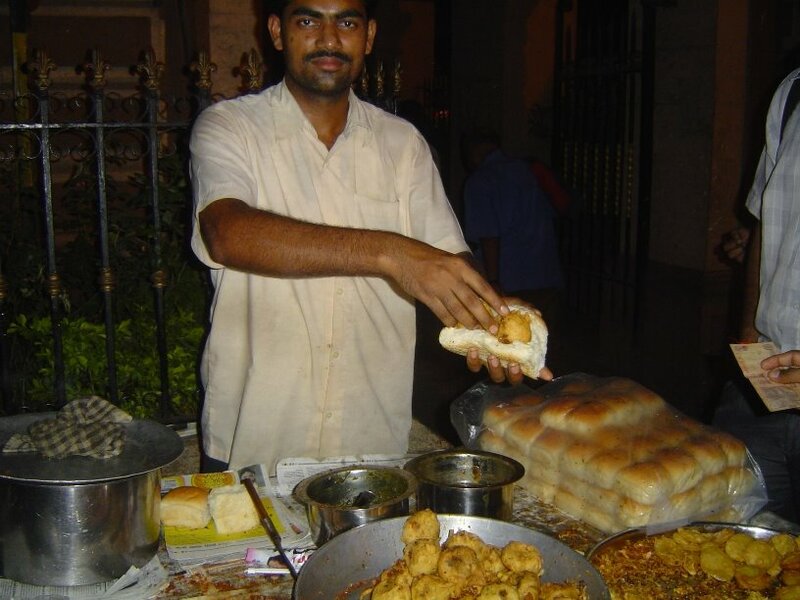 This is Bombay's trademark vada pao. Made of potatoes and bread, it's an Indian burger with guess what, a Portuguese twist! Thing is, Bombay wouldn't have any vada pao if it were not for the Portuguese. The Portuguese brought both bread AND potatoes to India, having acquired them first from South America. 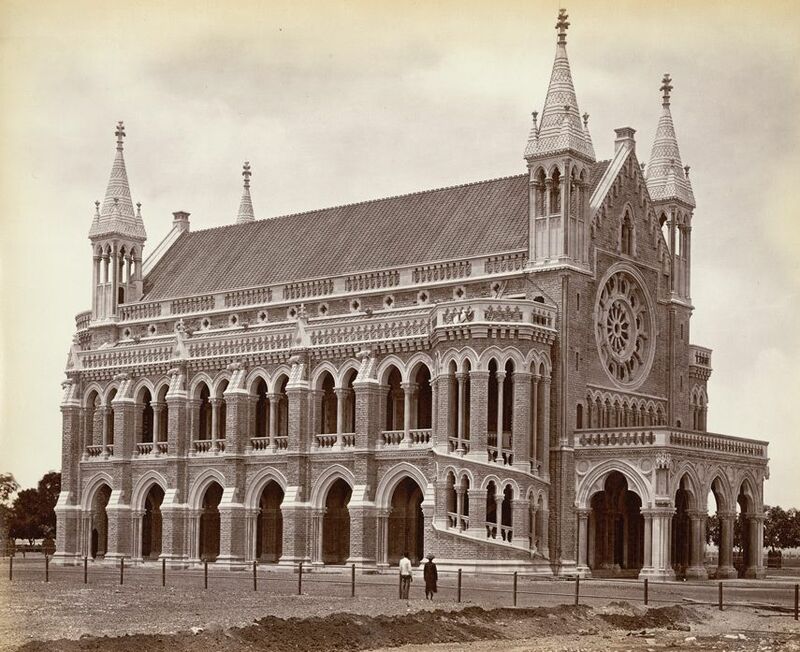 Pao was actually brought to Bombay by migrant bakers from the Saligao and Siolim, two small villages in Goa, which was one of the main settlements of the Portuguese (long sentence? :D). Did you know that Pao and Batata are Portuguese words? In fact, Bombay's very name is Portuguese! In 1509, the Portuguese explorer and trader Francis Almeida's ship sailed into the island's deep natural harbour. OK, back to vada pao - here's a recipe if you're wondering what it tastes like. The recipes for the chutneys that go with it are also there. The long-legged white-grey bullocks you see in Mumbai are variants of the Hallikar breed. Hallikars or Amrit Mahals were originally military animals, used in Tipu Sultan's army to pull his gun carriages and other army equipage. They were popular because of their stamina, and were reputed to be able to march nearly 50 miles in a day. 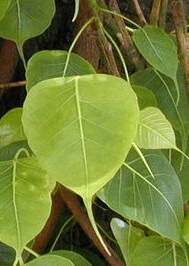 Hallikars are bred by families which have specialised in them over several generations. Another long-legged bullock is the Khillar, India's "horse among cattle". 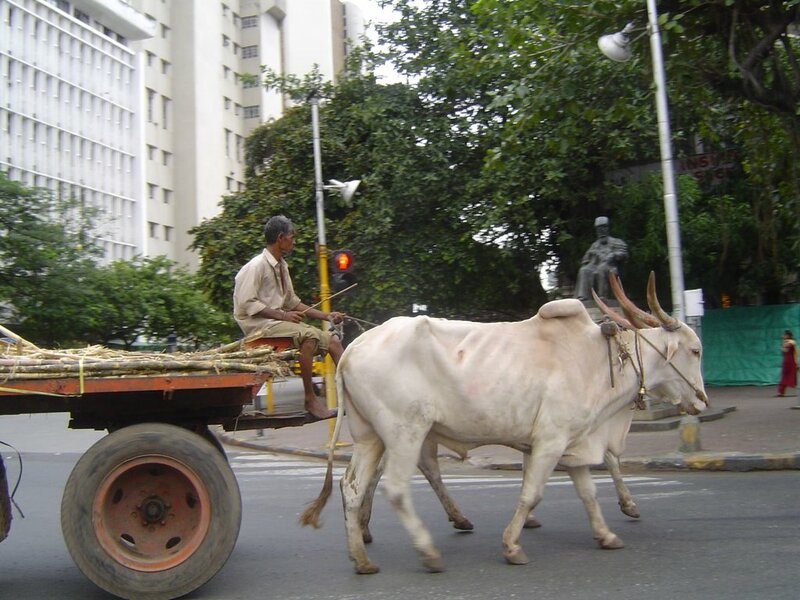 Khillars are racing bullocks, and are also used in Maharashtra's sugarcane fields. But of India's 26 indigenous breeds of cattle, the Ongole and the Kankrej seem the most interesting to me. The Ongole, for it's roots in mythology - The Ongole has inspired several statues of Lord Shiva's bull Nandi. Here is a picture of an Ongole bull, so you can see what I mean. See the short stumpy horns, the broad face, the ears and the body shape? 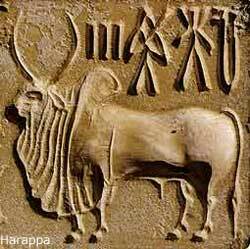 And I like the Kankrej for historical reasons - because the Kankrej, a hardy breed from Gujarat, features in the Harappan seal of the Indus Valley Civilisation. If you ever go to the Prince of Wales Museum near the Gateway of India, don't miss their Indus Valley Civilisation exhibit. I saw this bullock-cart at Flora Fountain, in the heart of the Fort business district. He's delivering sugarcane to the local Rasvanti Gruhs (Juice Houses). My favourite is a small shop near Regal, next to Sachin Tendulkar's restaurant, where you can get fresh sugarcane juice, crushed and iced. Sometimes they add lime and ginger, to give the drink a neat little twist. If you want something a little stronger, try Ganna Singh - it's an innovative cocktail that one clever little local restaurant has come up with. White rum and fresh sugarcane juice - how does that sound? (Ganna is Hindi for sugarcane). Personally speaking, I'll stick to rum and coke, but maybe you're more adventurous than I am! Sugarcane is grown locally in Maharashtra, in co-operatives using contract farming (more on that later). In the side-lanes of Mumbai, you might chance upon this sight - a woman waiting at the grinding mill. This lady has bought whole grain from the market, removed the stones and chaff, and has now brought it to the local flour mill for grinding. She's sitting there, watching the proceedings and making sure every grain is accounted for. And of course, this way, she can decide how much bran to keep. So chappaties taste different in each household, with varying textures and thicknesses. I used to buy Pilsbury flour, but my mum's chappatis were always better than mine, so like her, I switched to the local flour mill too (hers are still better, though!). 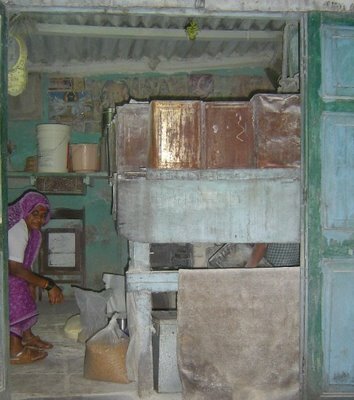 Before the advent of flour mills, women ground wheat at home, in circular stone grinders called chakkis. Not an easy job, as you can imagine, but good exercise for the waist! They were three sisters, rag pickers. While my guests were busy admiring the architecture, I coaxed the three into posing for me. The third sister was camera-shy, but relaxed when I spoke in Tamil. Where do you live, I asked them. They said, "We live in Matunga Dharavi, and you?" 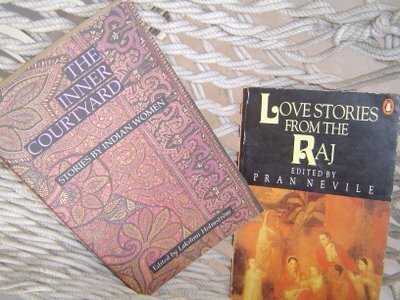 And in an instant, what started out as an interview, memsahib talking to commoner, became a conversation among equals. I was going to wear my environmental hat, and ask them about recycling, waste hazards and self-help groups. 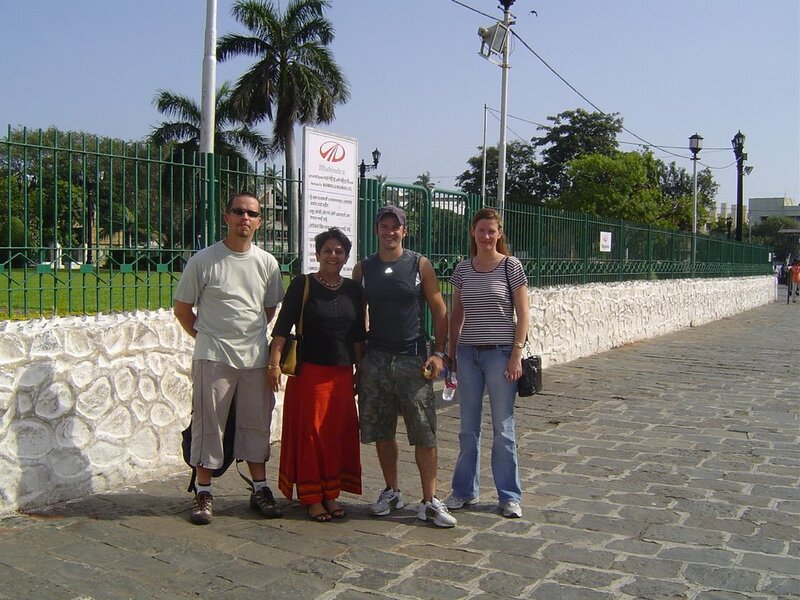 Instead, we spent the time chatting about our families and roots and life in the city of Mumbai. I was richer for it. 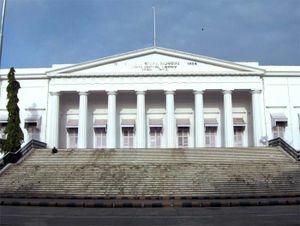 The Asiatic Library houses one of the only two known original copies of Dante's Divine Comedy. The other copy is in Milan. In 2002, the Italian Minister for Culture visited the Asiatic Library, and confirmed that the book was in better shape than the one in Milan. On a recent Mumbai tour, we saw this fisherman at Banganga. Guess what he had in his basket? 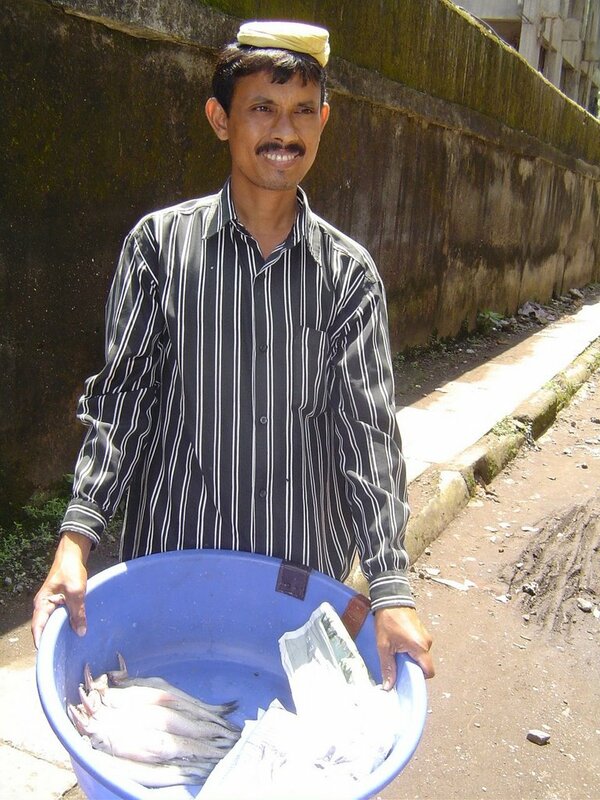 Bombay Duck. Locals call it bombil, and the fisherfolk 'Mumbai cho bomil', but the British named it Bombay Duck, and that name has stuck. So why did they call a fish a duck? 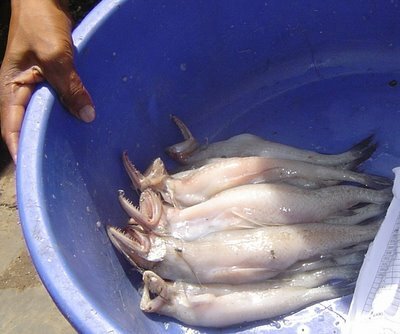 There's a theory going around that Bombay Duck is just a corruption of the Hindi 'Bombay Dak'. 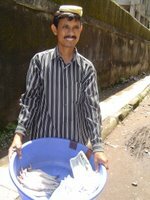 Bombay Dak (Bombay Mail) refers to the mail train in which the fish were transported during the British Raj. 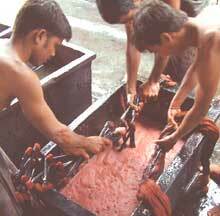 Another theory is that the smell of the drying fish reminded the British of the odour of the wooden railroad cars! 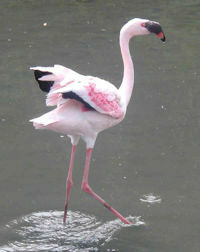 This fish is found only in the Arabian sea between Bombay and Kutch-Gujarat. 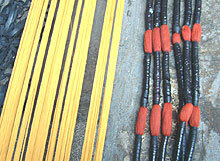 A large part of the daily catch goes straight for drying, as there are scores of people who relish 'sukat' - dried and salted bombil. If you take a walk on the beaches of Versova and Mahim, you can see rows of thin bamboo sticks wedged into the sand with salted bombils hanging by their tails, drying in the sun. If you'd like a closer look here's another photo of this lizardfish. Not a pretty sight, eh? 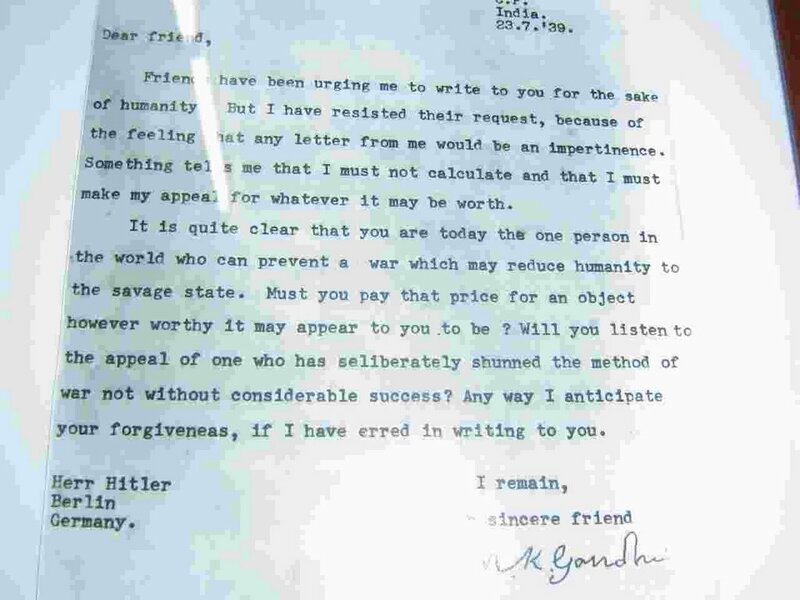 I went to Mani Bhavan recently, and found the original letter that Gandhi wrote to Hitler. The language is simple, the message brief. I couldn't come away without photographing it. The Mahatma's birthday is just round the corner, so it's a good time to catch a glimpse of the man. 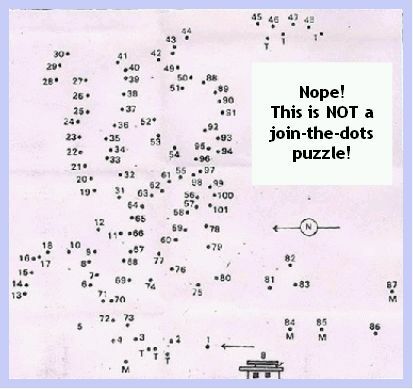 Click on the photo for a clearer image - you can easily read the text. "Please come for haldi kumkum at our house on Friday", says the invitation. 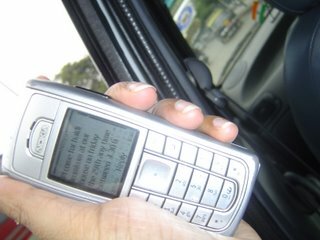 It's a modern-day twist to a traditional invitation, texted to my mobile phone. I am constantly amazed at how we are adapting to new technologies and change. I wrote an earlier post on the cell phone and how it's changing the lives of tradesmen. Now here it is, once again staring me in the face, this time from a mother of two children. The 'haldi kumkum' that she is inviting me to, is an annual feature among Tamilians during the Navratri festival. 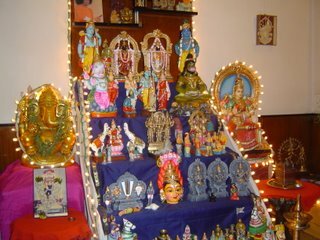 Tamil women celebrate this festival with elaborate displays of their doll and statue collections in their homes. 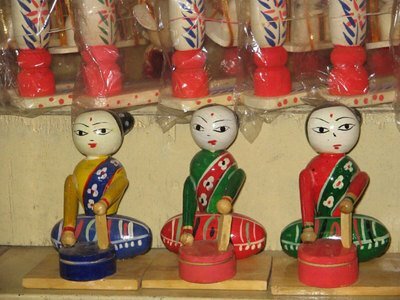 Women of the community go to each other's houses, admiring the collections and the creativity with which they are displayed. 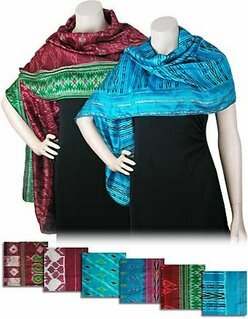 It is a time for chit-chat, much singing, and of course, a time to display your new sari collection. I went to another haldi kumkum yesterday, here is one photo from that visit. Each doll in the collection tells a story from mythology. I wish I could post all the photos, and tell all the stories! The Mumba Devi temple, where the city gets its name from, is in a crowded street in Bhuleshwar. Every Tuesday, there is a large gathering of devotees and you will have a hard time getting inside the temple during Navratris (The Festival of Nine Nights, towards the end of September). Although the locals worship this goddess, the deity primarily belongs to a caste of Hindus called char-kalshis (water carriers, char = four, kalash = waterpot; 'they who carry four waterpots') and the fisherfolk of the island. Initially the temple was near Phansi lake next to the Victoria Terminus station. In 1737, the 'Company Sarkar' - East India Company - planned to expand the Fort of Bombay, and ordered that the temple be shifted. The new temple was built in 1753 by a goldsmith named Pandu Sonar. 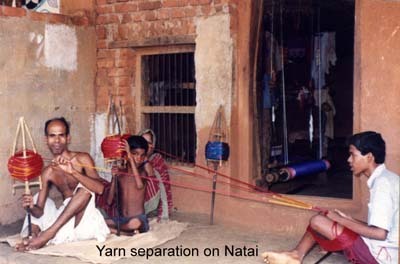 The wealthy and prosperous family of Pandu Sonar and his heirs became the caretakers of the temple. 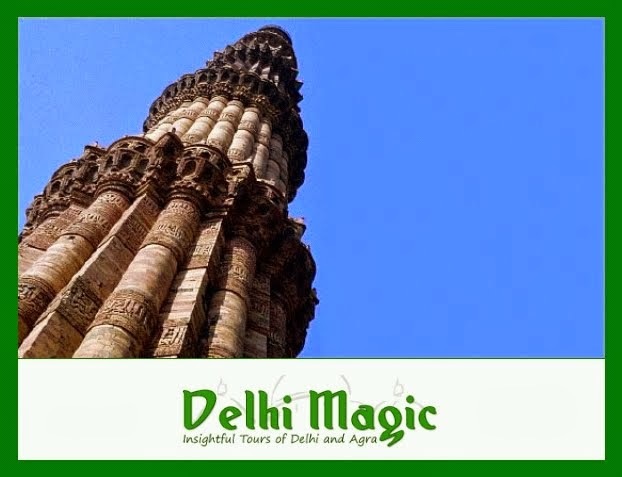 A water tank in front of the temple was built by a wealthy Baniya named Nagardas Navlakhia - his surname literally meaning a man worth 9 lakhs of rupees. 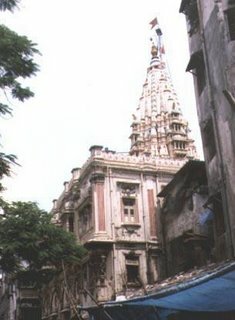 Near the center of the west side of the temple wall is the five foot high stone image of Mumba Devi in orange colour. On normal days, i.e. not the festival days, the goddess is dressed in a white saari and blouse with a gold necklace and a silver crown. 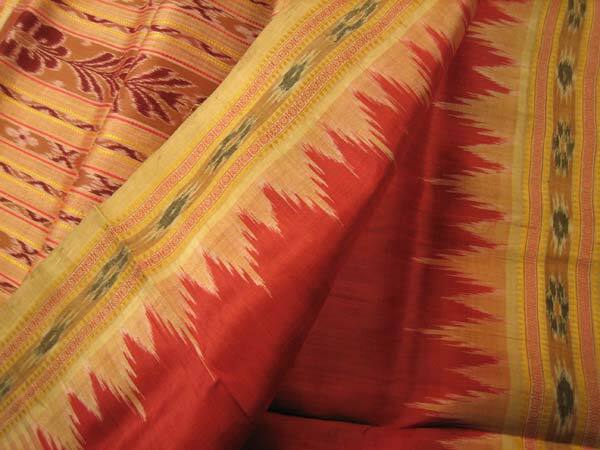 However, on special occasions she wears a special handwoven silk saree and several ornaments from the temple's custody. To her left side is the goddess Annapurna on her vehicle, the peacock. Anna (food) purna (fulfilment) is the goddess who ensures everybody gets to eat in the city. For a city that has 50% of its population in slums and illegal hutments, where trains loaded with people from other states pour in every day, this is quite a task! The vehicle of Mumba Devi is the tiger himself. This tiger is made of pure copper. This tiger was humbly gifted to the temple authorities by Vithal, a pearl trader in 1890. The temple also houses other gods such as Sri Ganesh, Sri Hanuman, Sri Balaji (a form of Vishnu). 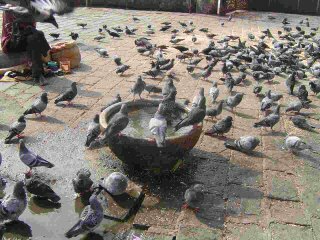 The only time that pigeons get into trouble in Bombay is in January during Makara Sankranti, when the kite festival begins. Kite flying originally came to India from China. Kite fighting, where you cut 'enemy' kites, was an annual feature of my childhood in Bombay. 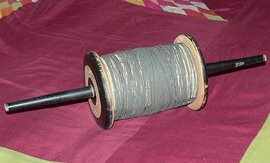 To help cut better, the manja string is coated with crushed glass powder. I remember going to shops and carefully, very carefully, selecting the kite and the string. We'd come back, run to the terrace, and fly our kites with glee. The older kids would swagger around, showing off their skills. And then someone would spot a strange kite in the sky, and the contest would begin. The two kites would dance in the sky, their strings in contest. Victory brought cheers and jubilation, and defeat sent us running down the steps, chasing the lost kite. I read recently, though, that kite fighting has one unexpected fallout - bird injury. Several pigeons are badly injured every year. It's the sharp kite string - manja - that does it. Perhaps the next time you see Bombay's pigeons, you'll think of this story from the Puranas. The story made its way into the Buddhist Jataka tales, and travelled the world. There's a wonderful Buddhist site near Hyderabad - from around 225 AD - where this story is carved on a stone slab. And if you ever go to China, you will see the Chinese version of this story in the Caves of a Thousand Buddhas (the Mogao Grottoes in the Gobi desert). We were at the Gateway of India on a bright sunny morning, and I knew it was going to be a good day. Even the pigeons were having a rollicking time, what with the water and the sun, and all the attention from tourists. I read somewhere that pigeons figure in Mughal miniatures, and Emperor Shahjahan, when he was not busy building the Taj Mahal, also had time to raise fancy pigeons. A few years ago, the Indian press was talking about the last surviving Police Pigeon Service in India. I think it was Orissa, and they approved the closing of the service because they thought $10,000 per annum was too much to spend on 300 pigeons. A pity, don't you think? I wonder where Bombay got its fascination for pigeons from. There seem to be kabutarkhanas everywhere. And at each kabutarkhana, there is always a chana-wala selling pigeon-feed. My childhood memories are filled with watching pigeons being fed near my school, and hearing the flutter-chutter of wings as they took flight.